Fantastic inexpensive gift for your athlete! All plaques are hand painted with non-toxic acrylics and roughed up to give an old worn appearance. Comes with eight pre-drilled holes and nickel hooks. DESIGN NOTE: Some pictures show seven (7) hooks. We now include eight (8) hooks on all displays. Be sure to specify colors upon check out or they will be painted as shown. For changes to font colors and/or name additions/subtractions, please type them in the notes area available during checkout. If nothing is specified we will use our best judgement on color sets. 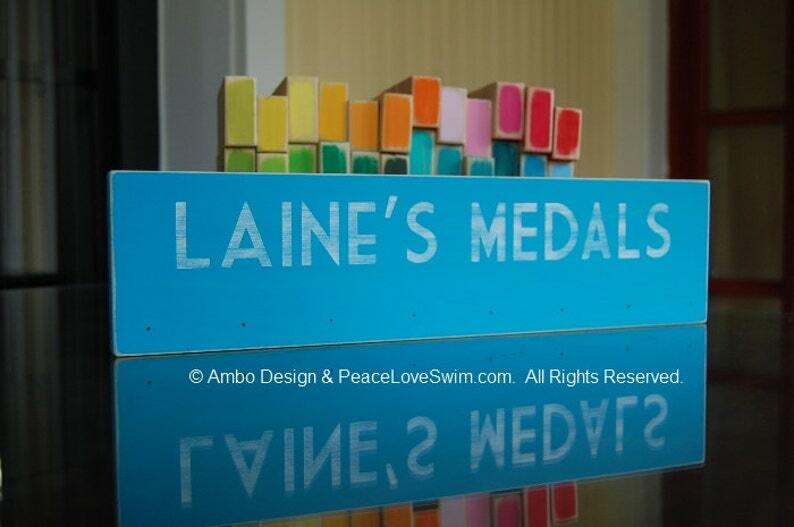 Future Olympian Sports Medal Display - Can Be CUSTOMIZED FOR FREE - You choose the colors, statements, sport, etc. The colors are perfect, turn-around time was quick, and it was easy to add the hooks on. I absolutely love how it turned out!